We'd been idly wondering how all the companies that benefited from the recent obsession with big, fancy weddings would deal with the economic downturn. A recession might make people crave emotional security and thus cause more marriages, but it might also spell an end to the entire Bridezilla phenomenon. Blueflyhas found an ingenious way around the problem with its new wedding website, which offers two options to users. Click "I'm in it" to be transported to a world of bridesmaid dresses; click "I'm invited" to see party-wear. 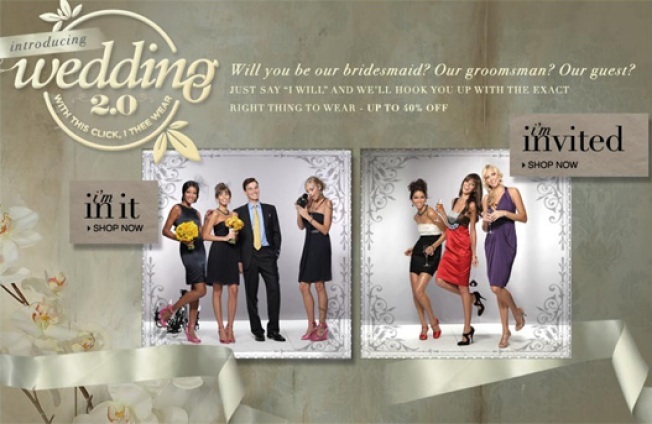 By making no distinction between members of the wedding party and guests, the site makes it seem like simply attending a wedding requires as much shopping as being in it—which works out pretty well for Bluefly, Bridezillas or no.